Spantek Expanded Metals was founded in 1963 and has been recognized as an industry leader in the expanded metal industry. Spantek is an ISO 9001:2008 certified manufacturer of expanded metal blanks-to-size and coil products for use in OEM and architectural applications. We believe that the price you pay for your expanded metal is only one component of the overall cost. At Spantek we focus on providing programs that address all expenses and non-value added costs associated with the procurement of expanded metal. This includes scheduling, planning, shipping and storage of your components. Spantek works with our customers to develop and implement programs that lower their total cost of doing business by focusing on not only the part price, but on every expense associated with purchasing expanded metal. 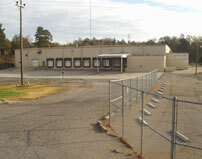 In 1999, Spantek purchased Coastal Expanded Metal, this facility was renamed Spantek-Greensboro from 1999 to 2009 until relocation to Lincolnton, NC in 2009. The combination of two plants, Spantek-Minneapolis and Spantek-Lincolnton, makes it possible for Spantek to offer dual sourcing solutions for expanded metal users.